The Eared Grebe is the most social, abundant member of the grebe family in North America often gathering in large flocks. The wispy golden yellow tuft of feathers behind the eyes that give the Eared Grebe its name and that along with the solid black neck makes him easily distinguishable during breeding season. The Eared Grebe is a rare winter visitor to Tennessee lakes, stopping briefly to rest and feed along its migratory route to the southwestern United States and Mexico, however some birds will winter in the state. Description: A small, slender, thin-necked grebe with a pointed, thin, upturned, dark bill and bright red eye along with a triangular head peaking over the eye and a dusky black neck and ear patch identifies this grebe in Tennessee during winter. In flight a white patch can be seen on the trailing edge of the wing. They tend to ride high on the water and often fluff their rear feathers, giving them the appearance of a “high stern” shape. Voice: Quiet and less harsh than a Horned Grebe. Song is a rising high squeaky whistle. Horned Grebe – In summer solid yellow patch on head, reddish neck and gray back. In winter white cheek and neck, white tip on end of bill. Pied-billed Grebe – Fairly common during migration and in winter this grebe has an overall brown appearance, a thicker bill and lacks the white wing patch. 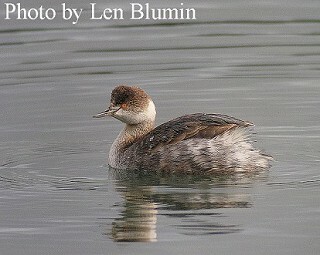 Habitat: In Tennessee, Eared Grebes can occasionally found on shallow lakes and ponds. Diet: Small aquatic invertebrates especially bring shrimp, small fish, mollusks and amphibians. 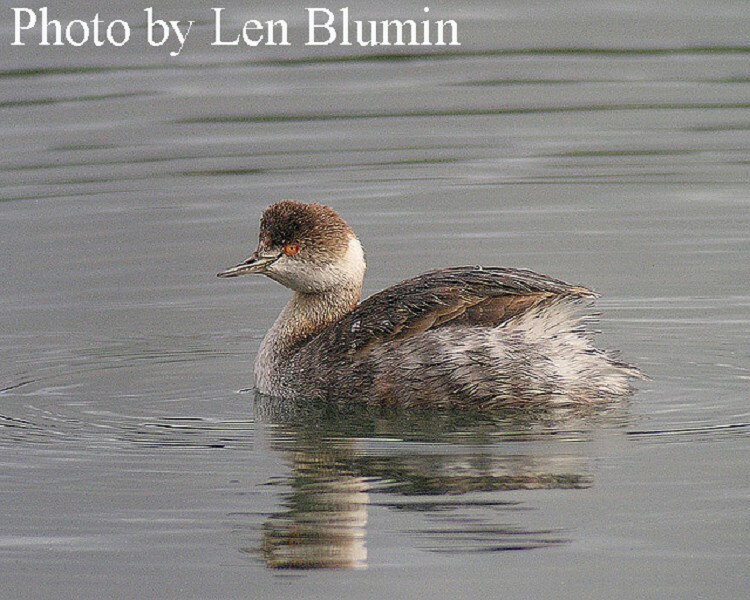 Status in Tennessee: The Eared Grebe is a rare visitor found in winter in Tennessee. Parents carry young on their backs. Eared Grebes only migrate at night. In fall Eared Grebes more than double their weight in preparation for migration.